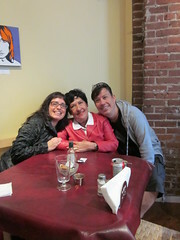 Last month, when my Mom was visiting, I took my good friend Janni Aragon (who as you know, teaches in the Department of Political Science at University of Victoria and who, like me, is an enthusiast of social media) and my Mom for brunch to Chef Suzi (a little quaint restaurant/coffee shop in Bastion Square, in the core of downtown Victoria. We were very surprised at how good the service was. 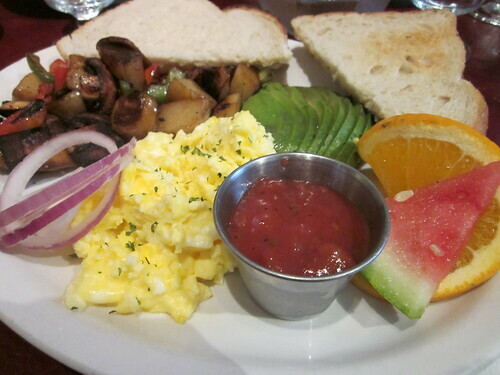 And how good our breakfast was too, and not expensive at all. I ordered the Chef Suzi version of Huevos Rancheros, which is not Mexican at all. But to be honest, we really were there just to hang out, more than the actual food. Chef-prepared meal preparation with an emphasis on tantalizing, wholesome, balanced meals using the freshest ingredients available. Leave the planning, shopping and preparation to Suzi, so that you can focus on what is most important to you. All meals fully cooked, in individualized containers, ready to heat and serve, or to pop in your freezer for later. I would bring friends here for breakfast, particularly for a little hole-in-the-wall so that nobody would bother us for breakfast. We had a few other guests sitting near by and they all seemed quite impressed so I’m quite happy that we ended up having breakfast there. Really, all we wanted was to celebrate Janni. And obviously, introduce her to my Mom. I’ll be back to Chef Suzi for sure. Disclosure: I paid for all of our breakfasts on my own dime.